At a dinner party in Boulder last weekend, there was some incredulity when I insisted that LA is greener than most people assume. The mild climate and density are key contributors to LA's low carbon footprint. No one argued with the fact that LA's generally mild climate requires minimal energy for heating and cooling. However, they didn't believe that Angelenos generally endure shorter (in distance) commutes than the national average. Like I wrote in Hometown, there is a huge disconnect between the way people actually live in LA versus the portrayal in Hollywood movies. Firstly, a sizable portion of Angelenos are poor. They don't consume much because they can't afford to. Even amongst Angelenos with money, they still consume less resources than their economic peers around the country due to climate and density. In general, the denser the neighborhoods, the closer the services*. The population-weighted density of the Los Angeles-Long Beach-Santa Ana (12,114) metro area is on par with San Francisco-Oakland (12,145). In fact, we are second only to NY-Northern NJ-Long Island metro (31,251). with the density of my current LA-area neighborhood. Each dot represents one person and I used the highest setting on The Racial Dot Map to create both. and the area around my LA neighborhood. Notice the difference in dot density? Or the difference in racial diversity? 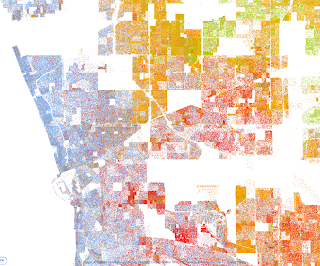 The red areas in Boulder are mainly graduate student housing. The large blank/white areas represent commercial zones and employment centers. Some of the smaller ones are parks, but most are retail and commercial zones. Notice the absence of a dense city core and the checkerboard effect of neighborhoods interspersed with white areas? This checkerboard helps explain why so many workers are able to bike or walk to work in metro LA. LA traffic is heavy and unpredictable. People who can afford it, and do not have family members commuting to far-flung jobs, live close to work. LA is NOT a paragon of greenness. We can definitely be greener. I only make the point that it does better than the popular misconception believed by many. * There are exceptions in highly dense poor areas ignored by retailers. 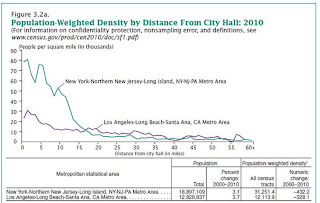 America's Truly Densest Metros brings up an interesting point about density as a function of distance from city hall (their proxy for the city center). 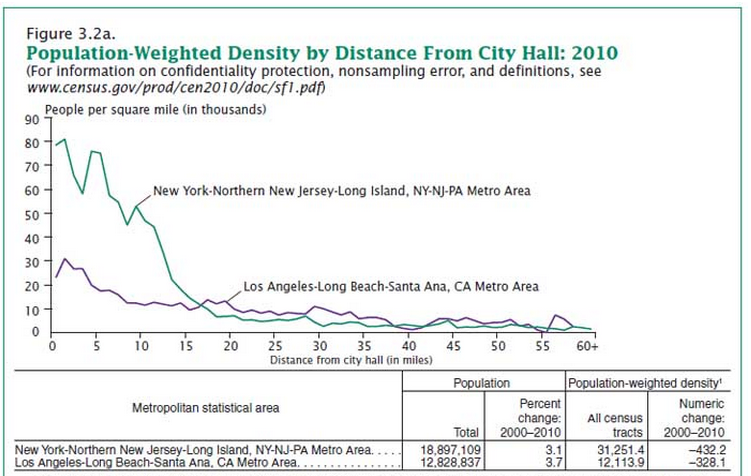 Notice how the density drops off much more slowly as you leave the city center for LA vs. NYC? If you look carefully, you will actually see slight .increases. in density around 17-20 mi and again 29-32 mi from city hall. 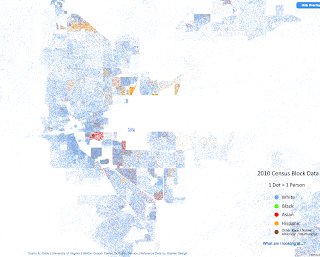 This reflects both the population density of the inner ring and second ring suburbs and the land devoted to light-industrial manufacturing scattered around LA. My neighborhood was originally a street-car neighborhood about 18 miles from downtown LA (DTLA). The trolley tracks were ripped out and light rail is slated to return. This density plot explains the unique hell that is LA traffic. There is literally nowhere you can go to escape density and traffic. Hence, Bad Dad and I made the decision to be non-combatants in the freeway scrum even though that limits our job prospects and the size of our house. We are not unique in coming to this conclusion. The average commute time interactive map shows that LA commute times are about average for the nation overall, despite the larger reliance on public transit (slower) and traffic gridlock. This is true only because people live closer to work. Don't be fooled by the large darker red areas. Few people live there, so the population-weighted commute distance/times is much, much shorter than the area-weighted one. Bad Dad pointed to some gathering clouds this evening and said that the news predicted rain. I'm a believer in the AMS study about the accuracy of TV weather forecasts. They showed that TV weathercasters ALWAYS overpredict rainfall because it keeps viewers glued to their TV sets. Predicting rain leads to higher ratings. Ratings, not forecast skill, determine the success of TV weather personalities. Who are you going to trust? The weather reader on TV or the professionals of the National Weather Service at the Oxnard/Los Angeles office? They are predicting gusty winds throughout the southland, but light rain only in Santa Barbara and Ventura counties, with some light snow in the mountains of northern Los Angeles county. I would be thrilled if it actually rains as far south as LAX. But, if it does rain 0.25" or more at our house, I'll bring him coffee in bed tomorrow morning, even in my current hobbled state. We might get a whopping 0.01" to 0.05" between 00Z Sat 26 Apr 14 and 12Z Sat 26 Apr 14. But, seriously, by the beach, it will be more like 0.01" or about as much mist as we get on a typical foggy summer day. BTW, if you are looking at this type of weather precipitation chart, the rainfall contours represent the amount of rainfall likely to occur since the last chart. So, if the charts are spaced 12 hours apart, then you are looking at the 12-hour accumulated rainfall prediction ending at the time stamp shown on the chart. Then the numerical weather prediction (NWP) model resets the rainfall accumulation to zero and adds up the rainfall for each timestep in the next N hours. If the charts are 3 hours apart, then you are looking at the 3-hour accumulated rainfall since the last chart. 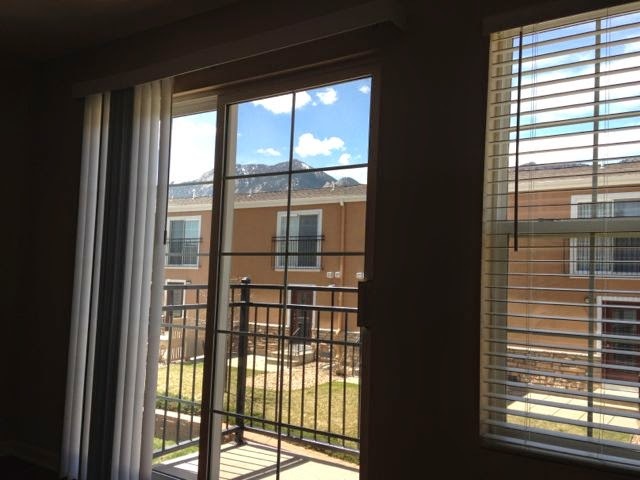 In the mountains, the amount could be locally lower or higher, depending upon whether you are on the windward or leeward (rain shadow) side of the mountain relative to the direction of the storm. What about the wind forecast? 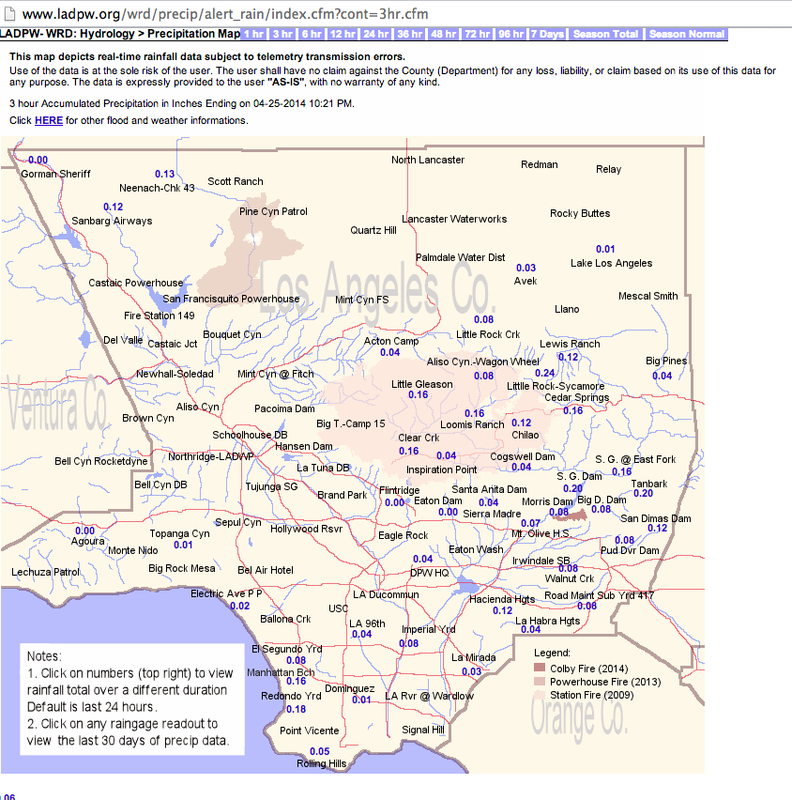 The California Regional Weather Server shows the jet stream will pass over LA. That's the same government-provided GFS that Unisys, Accuweather, the Weather Channel (and everybody in the commercial world) uses for their own branded weather charts. 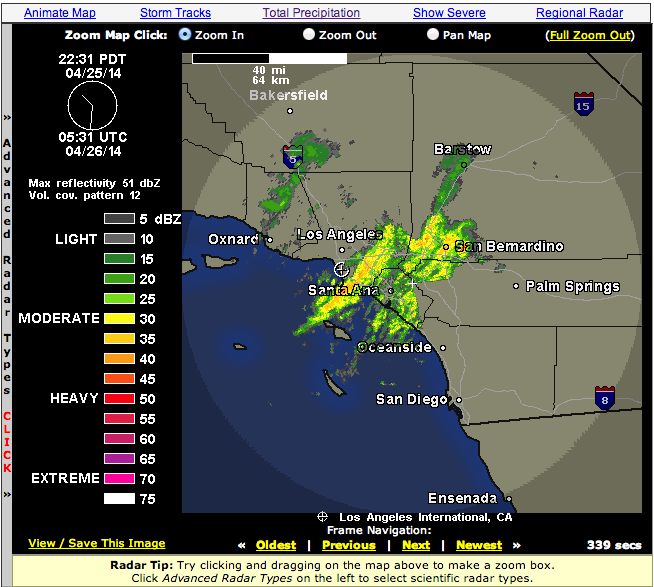 Sure enough, the local radar at LAX showed an uptick in gusty winds. * Wow, I am humbled. Or Bad Dad got lucky. Check out the current radar (circle is location of LAX). See that band of moderate precipitation? It briefly passed overhead and lead to a highly localized band of serious rain for 10 minutes, as seen in the three-hour actual totals at LADPW rainfall measurement stations. We just happen to live in the only coastal area where it rained tonight. But, I think I am still safe. It didn't quite hit 0.25" and there is nothing major coming down the coast behind this band. 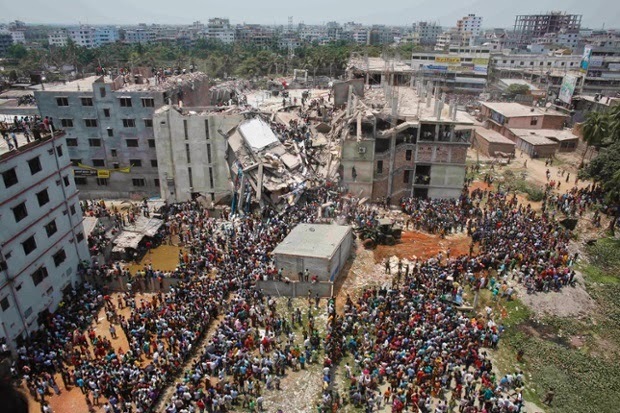 A year ago, the Rana Plaza building collapsed, trapping thousands of workers inside. I'm using a picture from the Guardian, but click through to their photoessay with heart-breaking close-ups. There are many news articles about the event on the one year anniversary, but I am particularly shaken by Jason Burke's reporting. He details how the factory owners used female supervisors, who are trusted more by the workers, to convince antsy workers to go inside a building that they feared was unsafe. That's the same way armies used NCOs to convince infantry to charge enemy lines when they refused to follow commissioned officers. Both resulted in large-scale slaughter. If you have a strong stomach, view The shirt on your back. The clean clothes campaign is urging people to use social media to shame businesses into paying up to the Rana Plaza victims fund. Carolyn showed pictures of herself wearing her clothes inside out for Fashion Revolution Day. We started a Q&A conversation about the ethics of clothes a few months ago, before life got into the way. But, we will be posting a series soon. I'd like to make a plug for Home Ec. Just as taking auto shop for a semester doesn't make you qualified to fix your own car, it does educate you as a consumer about how difficult a task is and how much it should cost to pay a skilled person to do it. If more people learned rudimentary sewing in Home Ec, they would be more wary of $10 blouses with lots of detailing or $10 jeans. I'm going to wear my favorite t-shirt inside out today. Luckily, I put a pocket on the inside. However, I can't wear my shorts inside out because I need the pockets, particularly because I'm hobbling badly. If they were inside out, you'd see the label that says they were made in Mexico, a medium wage country. The factories in northern MX are closer to my LA home than SF so I consider them locally-made. What are you wearing today? Who made it? Under what kind of working conditions? How much were they paid? How do they feel about their lives? Are you making their lives better or worse? Boulder is expensive. 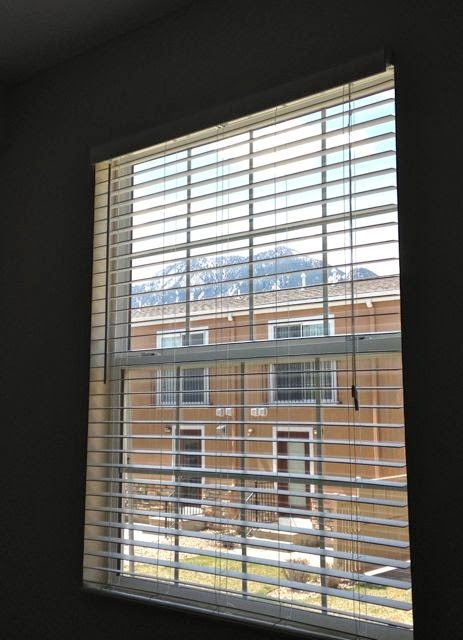 I had hoped to get a little bigger apartment for the money or pay a little less rent on such a small space. 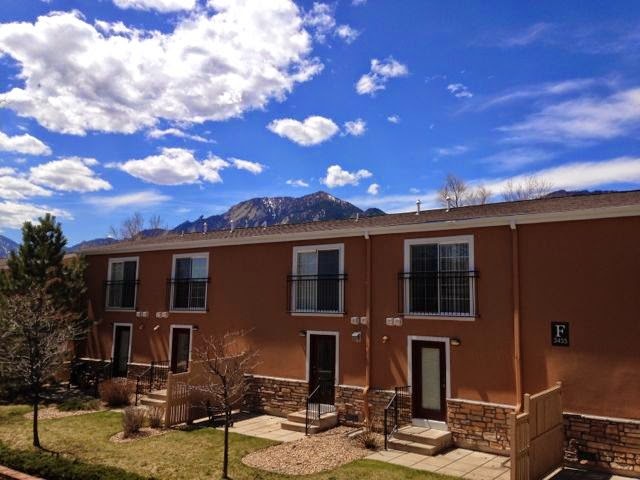 But, the location is ideal for car-free living, and the entire property is well-maintained and smoke-free. Dealing with the leasing and ever-changing rent structures (what is the deal with dynamic pricing and these mega-REITs?) was a PITA, but I am going to let that anger go in preparation for dealing with the utility and telecom companies. The housing search visit was a little bit too eventful. I would love to say that I sprained both (!?!) ankles in a base-jumping accident, but the prosaic truth is that I rolled one ankle out on a staircase, then rolled out the other one when I shifted my weight in compensation. I move solo mid-May and start the new job in late May. 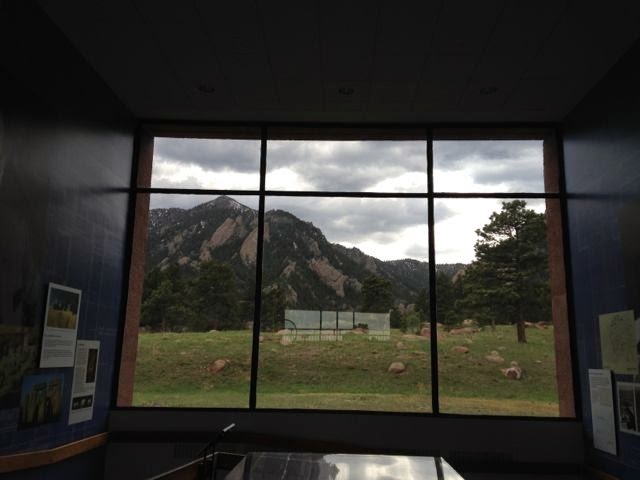 At first, I'll be working 100% in Boulder. Once I settle in and learn enough to be productive on my own, there will be distance telecommuting opportunities. Yes, work meetings are sometimes held on the trails. My office faces east, toward the great plains. Instead, I will be joining this team of professionals, who perform another interdisciplinary and hard to describe task in another FFRDC. This time, our specialty will be a core function instead of a "nice to have if we have the budget". I want to thank my friends in Boulder who took great care of me--and even loaned me crutches--as I hobbled around last weekend. Bad Dad and I watched the lunar eclipse from a beachfront bar on Waikiki Beach. What about you? We were really bad parents and left our sick kid in the hotel room while we walked to the bar at the historic Royal Hawaiian hotel. He said that we couldn't leave Hawaii without enjoying a drink with an umbrella in it at a beachfront bar. So we did. 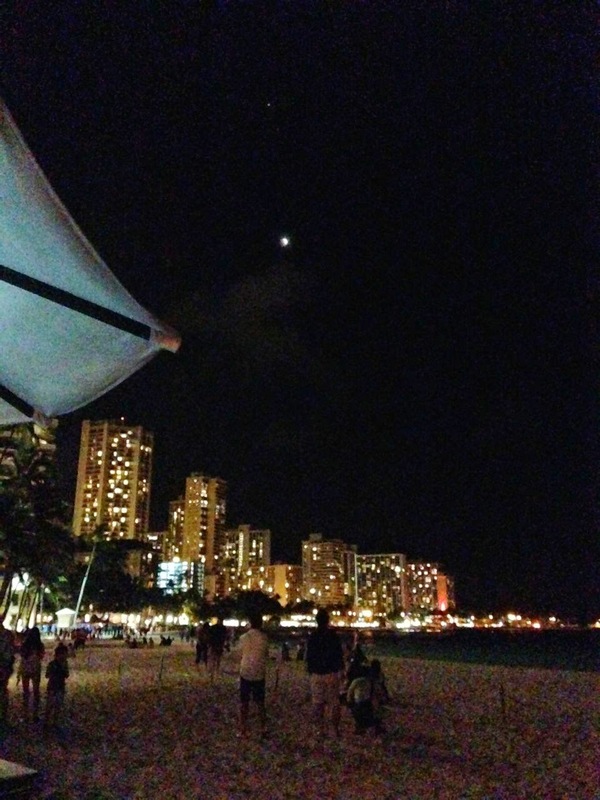 Notice how everyone on the beach is looking at the moon? It was a sky-gazing party at the beach. We flew home yesterday PM. I spent an epic day unpacking, doing laundry, and preparing for my housing search trip to Boulder tomorrow AM. I should be packing right now, not blogging. Eek! Ms McCall of Brown Paper Patterns keeps showing wonderful projects that she made with stuff she bought at The Fabric Store. For nearly a year, I wondered, "Which fabric store?" That's the name of the store. 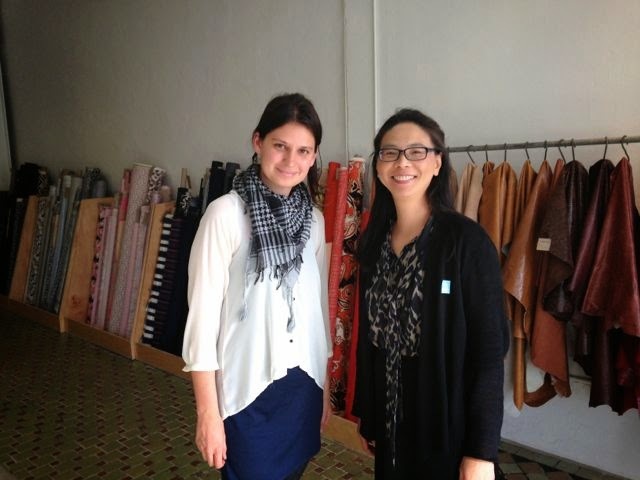 Recently, the LA Times ran a story about The Fabric Store (TFS). Actually, the article was an embarrassing gush-fest . But, I have to confess, I love the store, too. It's in midtown, only 0.6 miles from Mood's new 22,000 sf LA store, ~1 mile from LACMA and in the heart of LA's La Brea Design District. Visitors to LA should budget an entire day just to enjoy the district and another day to see LACMA. Or break it up and shop/museum for a half day each for two days. TFS works closely with New Zealand mills and sells amazing-quality merino wools in fashion-forward colors both wholesale and retail. Unfortunately, the full range is not available to retail customers (but there is still lots to select among). The fibers are so fine--as little as 18.5 microns--they rival cashmere for softness with no enviroguilt. They also sell designer closeouts from around the world to retail customers at good prices. If you are in Los Angeles for work, mid-town is easily reachable by public transport from both downtown and westside offices/hotels. From downtown, take the subway to the end of the purple line and then transfer to the Metro Rapid 720 express bus. Get off at Wilshire and La Brea. TFS is at 135 South La Brea, about half a mile north of Wilshire, on the east side of the street. From the westside, take the Metro Rapid 720 express bus east to La Brea and then walk. You can fortify yourself at some of the many fine restaurants in the district and visit Mood at the corner of La Brea and Wilshire, too. Bad Dad and I were discussing Michael Lewis' story about the discovery of how high frequency trading is used to rob the pension and mutual funds that hold your retirement savings. Much of Wall Street is out performing damage control to explain how the situation is very complex and no one can explain how they are robbing the majority. Actually, it's not that difficult to understand compared to the kind of mysteries that scientists routinely unravel. The big mystery to me was why it took 18 months for Bradley Katsuyama's team to discover what was going on. It would have taken much less time if they had a physicist on their team. Consider JILA professor and NIST scientist Judah Levine, aka the nation's "time lord". Back in the early 1990s, he explained to me (a graduate student at the time), how, when delivering time standards over telephone lines (and, later, over the internet), he had to take into account the time it takes for the signal to get to the other end. Is the phone line copper or fiber optic? He also helped develop time synchronization via satellite (Navstar and GPS)*. This is in addition to his geophysics research determining the source of earthquakes and other underground motions. If they had Judah on the team, he would have solved the mystery over lunch. * The speed of light is only a constant in a vacuum. The variation is small through the atmosphere and ionosphere. But, over long distances, light is slowed just enough that you have to account for the slowing. In fact, you also have to account for special relativity. Why can you read about military satellite launches before they happen all over the internet? Because there is no longer any point in trying to hide them. To find out when a military satellite will be launched, one only has to try to book a hotel room near a launch range and note the price. Prices spike whenever a launch is about to take place. If hotel rooms are expensive and scarce, but the open launch manifest of nonmilitary launches shows nothing, then you know what must be happening. You don't even have to call up the hotels anymore. Your software robot can just query the hotel websites regularly. Information leaks happen all the time, with real-world implications. and watch the launch of DMSP F-19 from the beach. A United Launch Alliance Atlas 5 rocket, designated AV-044, will launch the Defense Meteorological Satellite Program 19 spacecraft for the U.S. Air Force. 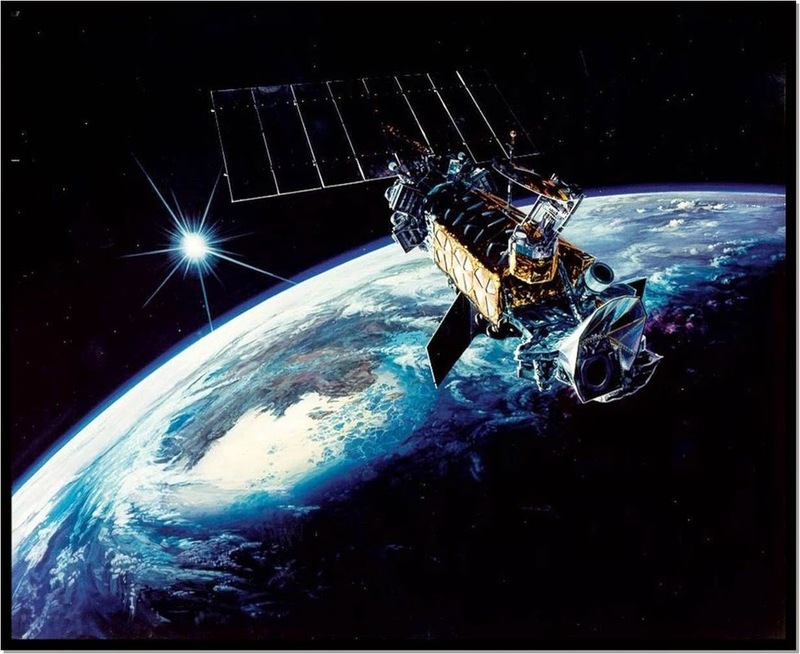 Built by Lockheed Martin, this polar-orbiting weather satellite will be used by the military for global weather forecasting. The rocket will fly in the 401 vehicle configuration with a four-meter fairing, no solid rocket boosters and a single-engine Centaur upper stage. F19 means it will be the 19th Defense Meteorological Satellite launched. This is the second to last one; only 20 were manufactured. I've previously pulled my kid out of school for the entire day to drive her to Vandenburg AFB for a prior DMSP satellite launch. This time, I think we will just watch the satellite fly by from the Manhattan Beach Pier. Spaceflight Now 101 has a page about the launch with links to the launch webcast and the ascent ground track. As I explained before, polar-orbiting weather satellites fly nearly due south from Vandenburg AFB. Tomorrow morning's sky is forecast to be clear so the entire Santa Monica bay should get a good view of the satellite as it flies by. In case you missed it, you can watch the video.